Do you struggle to get your horse on the float? Your one stop horse shop for horse supplies and riding equipment! At One Stop Horse Shop, we pride ourselves on the fact that we supply only the best horse riding equipment that is available in Australia and the rest of the world. We love our horses and we know how important your animals are to you, so having the correct horse supplies and equipment is a crucial part of maintaining their welfare. Horses are a part of our family and keeping them safe and healthy is always at the forefront of our minds. We offer a great range of horse and pony products from some of the best brands in Australia. We have horse riding boots, gloves, breeches and other horse riding clothes from the best brands in the business including: Horze, Kieffer, ELT, Waldhausen, Noble Outfitters, Flyveils by Design, Equinade, Joseph Lyddy, Showcraft, Eureka, World's Best Hoof Oil and lots more! Everything at One Stop Horse Shop is great value, and as the name suggests, we aim to be a one stop shop! The fact that we are horse lovers as well as experienced riders puts us in the perfect position to provide advice on all matters horsey! We appreciate that some of you may be new to riding and may be looking for a little help and reassurance. We have a selection of horse books that can give you the answers that you are looking for and are an excellent reference point. However, nothing quite beats asking the opinion of an expert, so feel free to ask us anything, no matter how trivial it may seem. For more experienced riders we have more specialised riding gear that may be more in keeping with your requirements. We have a selection of horse saddles and bridles that are suitable for different disciplines as well as other items and rider clothing that are designed to cater more for the experienced rider. Horses are our passion and we would love to hear all your stories, about you and your horse. We don’t see One Stop Horse Shop as merely a job, it is our passion! We stock as many products as possible in store and if there is anything special that you require we can always source it on your behalf. Regardless of how big your order is, maybe it’s just for a single horse bridle or fly mask, or a more expensive saddle or a pair of professional riding breeches, you can be sure that we will have just the products for you. We can deliver them across Australia or the rest of the world via Australia Post. All orders are dispatched promptly and if we should have any issues with products being out of stock we will of course notify you immediately. 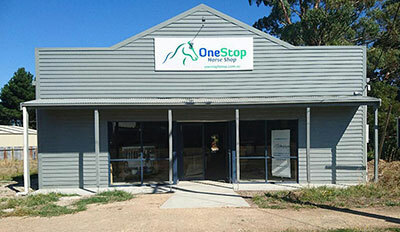 We now also have our brand new retail store, selling horse gear, rider apparel and stock feed, in Smythesdale, just 10 minutes out of Ballarat, Victoria! Not everything on our online store is kept in stock at all times, so please call in advance if there is a particular product you are after. If you would like more information about our horse riding gear and horse supplies you can email us on: info@onestophorse.com.au, call us on (03) 4301 7383 or alternatively you can contact us through our website. Our helpful team will be on hand to assist you with any of your enquiries.